The author of the two books is not mentioned. According to Jewish tradition in the Talmud the author was the prophet Jeremiah. It is remarkable to see the text of 2 Kings 24:18-25 nearly repeated word by word in Jeremiah 52. In various places reference is made to books, which contain more about the life of the king in question on which the writer may have based his accounts on. Reference is made for example to the book of the Acts of Solomon (1 Kings 11:41), then several times to the book of the chronicles of the kings of Israel (1 Kings 14:19; 2 Kings 15:31) and to the book of the chronicles of the Kings of Judah (1 Kings 14:29; 2 Kings 24:5). Besides that the record of the life of Hezekiah or Isaiah 36-39 is to a large extent rendered in 2 Kings 18-20. The author of the books of Kings was able to use these "references" under the guidance of the Holy Spirit while writing his godly inspired work. The history of the 19 kings each over Israel and Judah (without queen Athalja) is the report of the second decline of the people of God. After Israel's salvation out of Egypt and its introduction into Canaan under Moses, Aaron and Joshua, the people declined the more and more from God despite of priesthood and the office of judges. By introducing the kingdom under David God made a new beginning with His people but after a short time the decline started again. The first period ended with the people's rejection of Jehovah (1 Sam. 8:7) and in the second period Israel had to be rejected of God (2 Chron. 36:16). After bringing the ten tribes of Israel into Assyrian captivity in the year 722 BC the King of Assyria brought foreign people into Israel and let them live in the towns of Samaria (2 Kings 17:24f). They apparently mixed with the remaining Israelites and remained faithful to their idol worship. By order of the Assyrian king one of the captured priests of Israel was brought back to point the heathen resettler to Jehovah. But they would not give up their own idols but retained the character of a mixed people ('mixed multitude', Ex. 12:38). 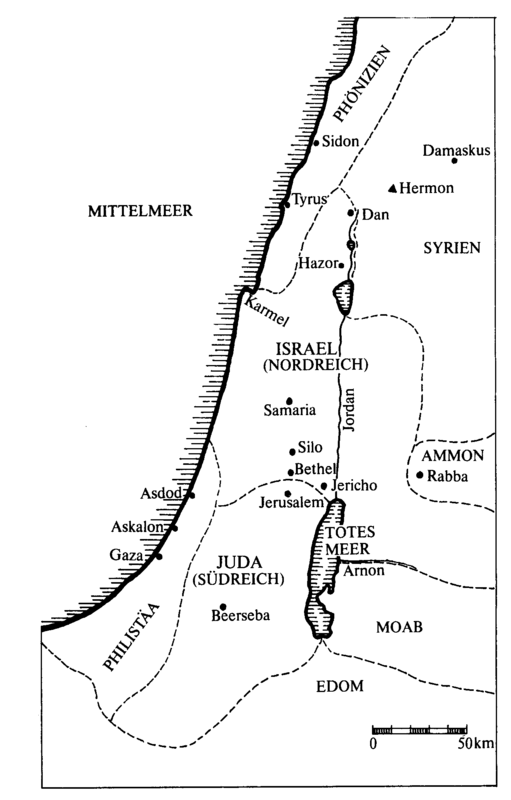 Later the Samaritans built an own sanctuary on Mount Gerizim and took over the Pentateuch as binding Holy Scripture.